HAUNTING GURU INTERVIEW: Winners of the Home Haunting Triple Crown, Thérèse & Hugh of the Rutherford Manor Haunt join your G/Host in the dungeon for a few adult bevies and to discuss their award-winning 2015 haunt season. MAD PROPS FOR PROPS: Jason Becker lifts his "Graves of the Groves" haunt to new heights in his Freight Elevator Simulator. SHOCKTAILS: JT hosts another Shocktails party at The Last Bar on the Left and of course the only one to show up was Baker. Beer, nonsense and neanderthal opinions flow as the boys review Rob Zombie's 31, and Adam Wingard & Simon Barrett's Blair Witch. Cheers, fiends! CHARMED POT: Our Mistress of Mayhem drops a tale of terror into your treat bag. 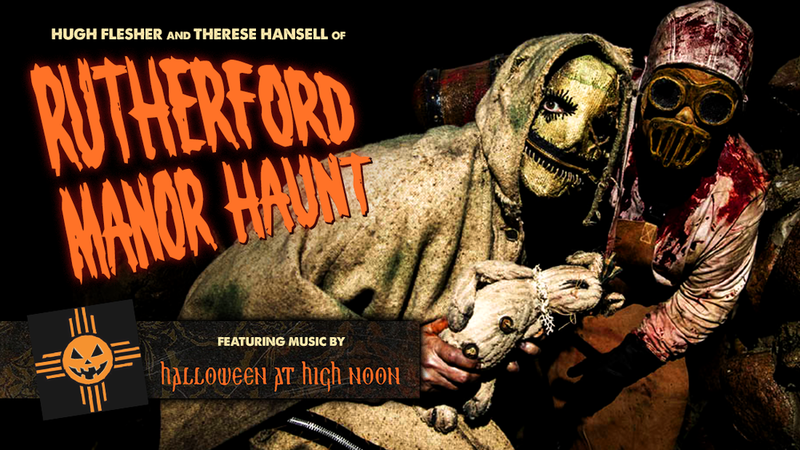 GHOULIE GROOVES: Halloween at High Noon provides the synth driven soundtrack for our Samhain spooktacular.